The concept of safe migration concerns the promotion of legal labour migration as a means to safeguard the rights of migrant workers, who leave Georgia in search of opportunities elsewhere.Safe migration is also about raising awareness of the risks that are inherent to irregular migration processes and the dangers of trafficking in persons. Mobility Centres offer citizens of Georgia up-to-date, practical information on migration processes. Individuals, who plan to travel abroad for various purposes (employment, tourism, education, residence etc. ), will receive objective information on legal migration practices, employment opportunities abroad, migrants rights and threats that accompany illegal migration. The centres offer telephone, individual and online consultations.You can also use our online consultation service.The consultations are confidential and free! If you have any questions or need assistance, call our hotline number: (+995 32) 2 91 34 61 from Monday to Friday from 09:00 – 17:00. Calls are confidential and free! Click here for contact information of Mobility Centres. For more information on safe migration practices you can download this brochure. 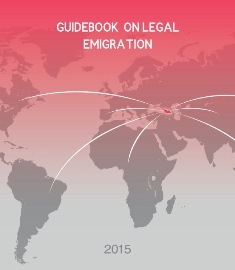 Download the Guidebook on Legal Emigration to get practical information on the whole range of issues such as the documents necessary for emigrants, the legal ways for temporary or permanent departure from Georgia or return to the country as well as information on the state and non-governmental organizations dealing with migration. For more information visit the website of the State Commission on Migration Issues.